Shop floor is the heart of a manufacturing organization and the way it is operated determines the organization’s business health. The main challenges in effectively running a shop floor are to ensure higher machine availability, reduced idle/down time and get higher yield by constantly monitoring the shop floor environment. The main cause of these challenges are limited visibility and communication between machines and personnel. In a conventional shop floor set up, machines are not connected with each other and to a monitoring system. Hence, when they break down or remain idle, the shop floor personnel managing multiple machines and work orders are not aware of the problem till they come across. A connected shop floor environment is the key to the solve these challenges. When machines are connected to a monitoring system in turn connected to an ERP, data flows continuously and is visible to all key personnel on the shop floor and other departments. This helps them to take quick & informed decisions in terms of quick response to breakdowns, better machine and personnel allocation, handling ad-hoc/emergency orders. These decisions are totally backed by real-time data and not dependent on experience or assumptions. Machines in a shop floor are connected to a machine monitoring system. This is a network-based system comprising of a Machine Data Collection (MDC) device that is connected to the machine and to a centrally located server. The MDC device constantly tracks setup start & end time, job start & end time, down-time, idle-time between jobs etc. It alerts the operator in case a machine breaks down between a job operation or because of other factors. An operator can also manually record machine login/logout time, reasons for down/idle time, scrap materials, job status, new job information etc. Apart from the normal operational details, the system also indicates the quality of the yield produced by the machines through in-process quality management. Out of the total jobs over a specific time-line, it indicates how much percentage of produced goods have met the quality standards, how much need rework and how much needs to be scrapped. This is displayed for each machine that runs these jobs on specially designed dashboards. It also indicates what is the cause of low yields thereby providing enough data to personnel and supervisors for immediate rectification. The ERP that is connected to the machine monitoring setup constantly sends communication regarding new orders, updates inventory levels based on materials allocated/consumed against each order, and also alerts in case of low availability. It also updates the order status post production till closure. Login/logout details of machine and personnel are also updated for each order. Limited human intervention ensures higher data accuracy and therefore preventing miscommunication and wrong data-backed decisions. The machine monitoring data can be viewed in different formats and levels on a daily/weekly/monthly basis and also in real-time on the shop floor. All data recorded over a particular time period is stored enabling supervisors and personnel to view them and conduct in-depth analysis. 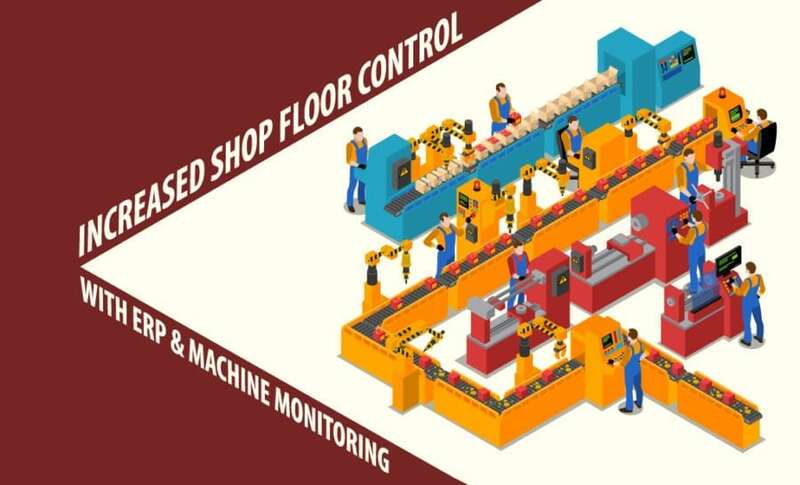 The automation of shop floor due to interconnection between machines, ERP and machine monitoring systems ensure that human errors are reduced significantly, and information is sent to the right person at the right time for the right action to be taken. Machine utilization is at its peak at all times and achieve near-zero downtime. Work orders are seamlessly prioritized, executed with real-time status on progress/completion. Shop floor has the latest information on materials consumed, available inventory, scrap generated, rework to be done etc. For effective inventory deployment and costing. Information is displayed in different forms for various levels in the organization i.e. plant supervisors, shop floor personnel, shop owners etc. Process changes are undertaken in manufacturing processes, shop floor management, material management, personnel training & management based on insights from the data. Thanks for your hard work. Nice information and very much appreciated. Thank you so much Sir! Do follow our blog for more information and knowledge on the latest manufacturing & ERP practices.